We recently reported that a Mr. Mike Kasper set the new world record with his high score on an original Donkey Kong Jr. arcade cabinet. Now, all thanks to the recent official Wii U Virtual Console going live, Wii U owners can save their quarters and work on their Donkey Kong Jr. high scores right from the comfort of their own homes in the NES version of the game. But before you invest your time seeking the glory that comes with setting a world record, you may want to consider what you’re getting yourself into. 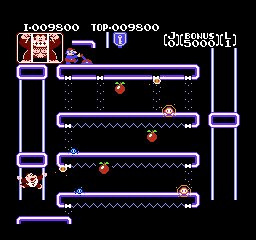 As is par for the course with many of the older arcade-turned-NES titles, the gameplay in Donkey Kong Jr. focuses on working your way upward while collecting items for bonus points. 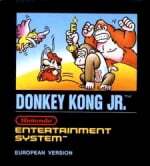 In an odd role reversal that sets Mario up as a villain and Donkey Kong himself as more of a sympathetic character who has been captured by the moustachioed plumber, you take on the role of DK’s son, the eponymous Donkey Kong Jr. Beginning at the bottom of the stage, your goal here is simply to work your way up and save your father who is being held captive at the top of the screen. 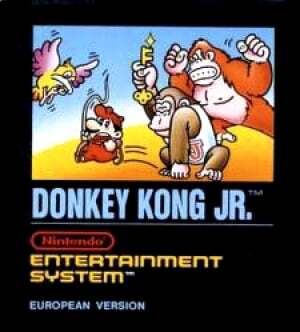 The gameplay can easily be compared to its predecessor Donkey Kong or Ice Climber, another NES launch title. With only four playable stages, repetition is the name of the game. 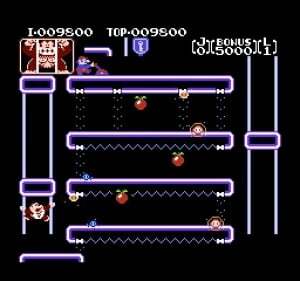 The first three stages follow the basic “work your way up” formula to a T, while the fourth has you climbing ropes in order to push keys upwards to release the locked up Donkey Kong. After finishing all four stages, the game then begins to repeat itself, starting back at stage one and progressively getting more difficult. There is also a game “B” available to play, but this mode features the exact same stages, albeit slightly more challenging versions of them. Unless you really enjoy the four stages that this game has to offer, there’s a good chance that you’re going to become tired of this one sooner rather than later. And for those players who want to bore a friend, there is also a multiplayer version of both game modes available. Multiplayer is exactly the same as the single player game, but as soon as one player loses a life, then they must pass their controller off to their patient comrade. 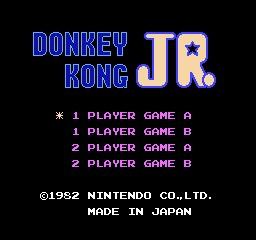 Donkey Kong Jr. retains the simple controls of similar arcade titles, with movement linked to the left stick or D-Pad while the A button is used to jump. Like any other Wii U Virtual Console game, the GamePad’s touch screen can be used to access the VC menu as well as display an off-television version of the game you’re playing. Beyond the second screen, nothing has been changed in this rerelease. 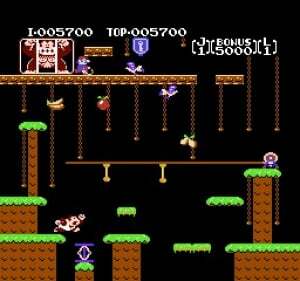 Though the gameplay and controls may be simplistic, Donkey Kong Jr. is plagued with collision detection issues similar to those that make Ice Climber such a chore. Very often you will find yourself meticulously timing and aiming a jump just to fall through the edge of a platform or get knocked down by an enemy a couple of pixels away. Beyond the issues regarding collision, there are also several other slight bugs that will cause you to become stuck in place, resulting in an unavoidable reset of the game. Couple these issues with an already wavering difficulty curve and you’ve got a nearly perfect storm of unmanageable inconsistency in gameplay. Like many of the NES launch titles, Donkey Kong Jr. is an 8-bit outing whose age is starting to show. Repetitive gameplay, frustrating collision detection and game breaking bugs all work towards the detriment of this one, resulting in a game that, while charming, tends to be a bit too rough around the edges. Fans of the arcade and NES originals might get a kick out of this one as a Wii U VC launch title, but younger players lacking nostalgia for the golden age of gaming will find more flaws than can be ignored. Real life achievement hunters like the formidable Mr. Kasper may want to set their sights on a game with a little more substance. Much better than Ice Climbers. That was rough, this is just old. I hated the collision detection in the 1980s when I was a kid. But now I've been enjoying the game on 3DS as an Ambassador. I wouldn't have paid for the game though. I think this game doesn't stand a chance to the original. @dekuchu64 I find with VC games the volume is really low compared to the Wii Menu. Anyone know of a setting? I tried this since I was an Ambassador. I hated it. I am so glad I got to download the original Donkey Kong on there. This game was like, one of the first games I ever "beat" as a child. Aww, I actually enjoy this game. 7/10 at least for me. This was my first or second game ever. For Atari 2600 though. I have to admit I loved this game as a kid I liked it more than the original DK but yeah it does so its age big time nowadays. Man sometimes I feel like the only one who actually likes Ice Climers... But I hate this. Personally I think that the original Donkey Kong played better than this, but that is just my opinion. I love this game, along with a lot of other NES arcade classics, and arcade classics in general. All the kids want to play today is Halo and COD. It's a real shame what gaming has come to. @6ch6ris6 It was. This is the third time they reviewed DKJR. One for each time it was rereleased for a system for Virtual Console. I don't like this game too much. It mostly had to do with its awfully designed level 2. Come on man, this is not worse than the hideous Ice Climbers. It's too short and rough around the edges but it isn't a Bad game and it is certainly not inferior to Ice crappers, which is really a broken game. I got this game as an ambassador present for my 3ds, and I still have yet to try it. @CaptainSquid Actually I enjoyed Ice Climbers too, though it gets pretty brutal throughout the midpoint of the game. The physics took some adjusting to but after that it was quite enjoyable. I guess it's a alright game along with the game & watch version. Donkey Kong is great. DK junior is good. I recently downloaded DK Jr for the first time yesterday. I also got it as an Ambassador game as well. The ratings for many of the early NES games, including black box launch titles, arcade ports, etc tends to be on the low side for no good reason. I have fond memories of Donkey Kong Jr., It being one of the NES games I played when I was young. I have it on my 3DS, so I've got no need to buy it on the Wii U, and although I've played it only twice (1st Sept 2011 and 19 Dec 2012! ), I think it's a game I can probably enjoy a bit more. It's definately more enjoyable than Ice Climbers in my opinion. I really enjoyed playing this again when i got it on the 3DS ambassador scheme. Would give this a 6/10 as its got a few faults, but it's still a good port of the arcade game and a fun game. As someone who loved this game when it was first released back in the day in the arcades and played it constantly, this review kinda stings. Why don't they port Arcade versions of Donkey Kong and Donkey Kong Jr.? They are so much better then the NES ports! @Ron DelVillano It's so good that you are sincere about some old games without an exaggerated retro love.